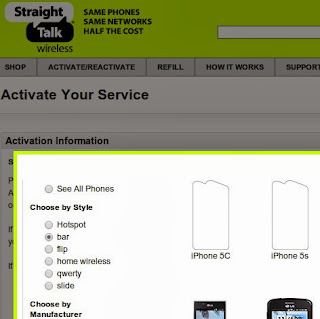 Go to http://www.straighttalk.com and click ACTIVATE/REACTIVATE in top menu. Then click Activate my Activate my Straight Talk Service, then Continue. On the next page click HELP next to the Serial Number/IMEI/MEID/DEC field. At this point I have no idea when, if ever, Straight talk's iPhone 5S and 5C will be released, what they will cost or which operator's network they will run on. Current Straight Talk iPhones run on Verizon and were priced at full retail when releases. That would mean $549.99 for the 16GB 5C and $649.99 for the 5S. Before you get too excited you should know that new phones often appear on the StraightTalk activate phone page weeks or even months before they are released. Sometimes phones that appear there are never released. Wonder if it's Verizon and Lte enabled. No Verizon mvno uses lte right now. I'm sure it's coming though soon enough. Nothing would make me go back to Straight Talk. Their service and processes are just too awful. I got an iPhone 5 at $150 off (double promotion) and the ST $45 for my daughter. The wireless service is VZW good. I'm going to port her old number to the handset this week. So far, so good... Everything works, data, MMS and so on.